Read the title to the beginning tune of The Little Drummer Boy, just so your afthead is in the same mental space as mine. Welcome readers. It’s been hot here. How about where you are? Hot too? (Maybe not if you are one of my southern hemisphere friends.) Well, nothing makes me feel more comfy in the summer heat than some thrummed slippers. Total lie. Thrummed slippers are miserably hot summer footwear, unless you are the nine-year-old member of the Afthead family, in which case you have joyfully spent June and July wearing fuzzy crocs and your mom’s thrummed slippers in 90 degree heat. Not wanting my slippers to get all gross with kid sweat I cast on so she could have her own pair. My slippers are boring adult brown and yellow, using up yarn I had no plans for and the cheapest non-itchy piece of wool roving I could find at the knitting store, but I had big plans for my daughter’s slippers. Rainbow plans…. When my favorite local yarn shop, The Recycled Lamb, went out of business, I bought this amazing tube of roving: Three Feet of Sheep in “Rainbow Twilight” by frabjous fibers, because I had a feeling that more thrummed objects were in my future. 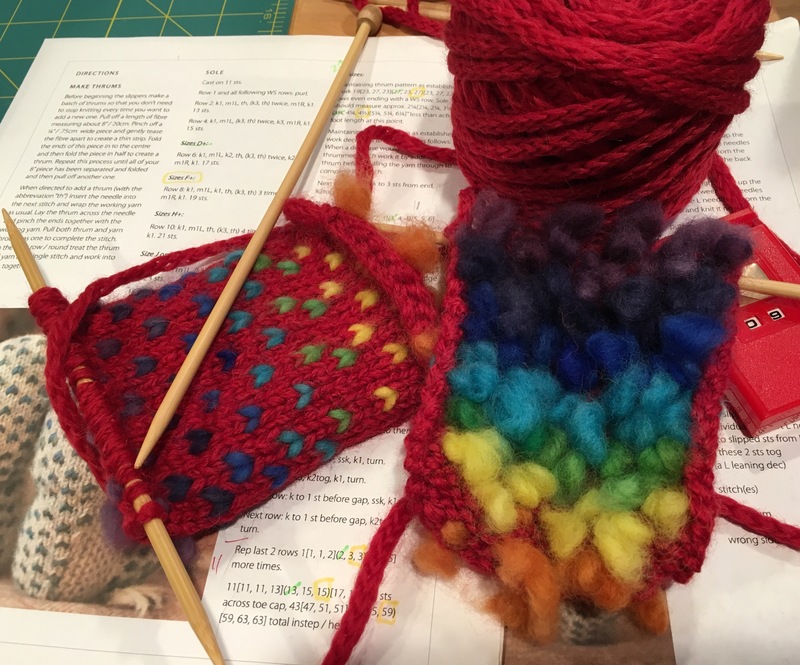 The assortment of colors combined with a red Debbie Bliss Paloma from the stash – chosen because it’s “not itchy” – made an exceptionally colorful slipper. For you knitters who haven’t thrummed, be warned that it is putzy and not a travel friendly knitting project. That said, it’s novel and creates a colorful fuzzy finished product that I love. Luckily I had a 9 hour conference call and laryngitis, so needed an activity to stave off sleepiness while listening but not talking on my work call. Thrum making was the perfect activity! Patiently I separated the balls of roving, tore hunks off, unraveled the hunks into lengths which I folded and twisted into thrums. The cats had to be locked out of the room during this task, because kitties love thrums. The thrums did not take the whole 9 hours to make, so I started knitting on the call too. (Really, if you knit and frequently have boring conference calls, may I suggest that you combine the two activities. I’m much more engaged on my calls when I’m knitting. Odd, but true.) I knit both slipper soles first, because I wasn’t sure I had enough yarn to complete the slippers and liked the idea of contrasting pink tops more than I liked the idea of mismatched pink and red slippers. 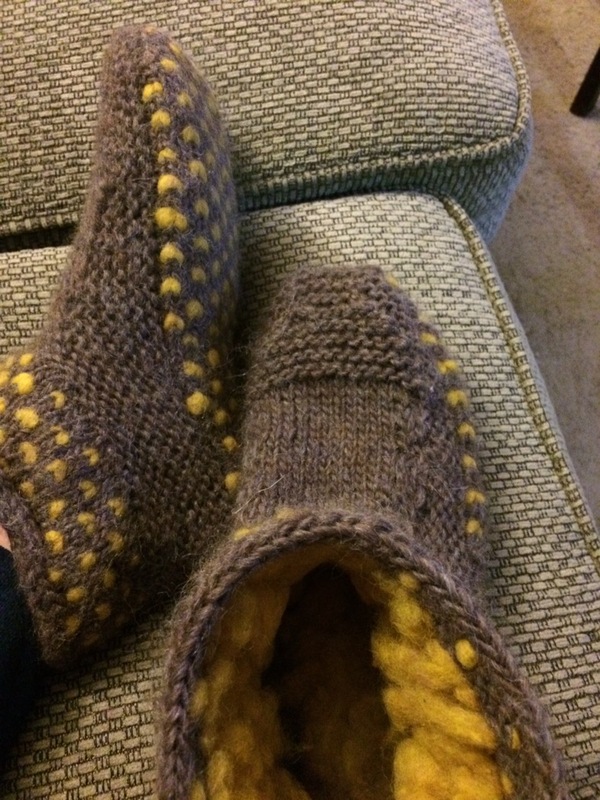 In the end, I had enough yarn for both slippers because I shortened the top to only four rows of thrums, which seemed better for the smaller scale of my daughter’s feet and legs. Also, like with my slippers, I modified the pattern to use an i-cord bind off, because I like how the extra weight of the fabric keeps the thrums from escaping over the top. As soon as the last slipper was cast off, my daughter’s ran outside in them. Screaming after her, “Not outside with the hand knits,” I noticed the lovely contrast between the new slippers and the concrete. Therefore, I demanded the ungrateful child take them off so I could photograph them before the slippers came back inside to live. If you are a knitter and never thrummed before, I recommend the Yarn Harlot’s blog post about the topic. As always, Stephanie Pearl-McPhee is a knitting genius. I love them! Pattern and color perfect. The thought of wearing right now (or potentially any time except after a day of freezing skiing) makes me sweat! But I still love them! Lucky cool natured gal! Need the rainbow one for my granddaughter – who will also likely run outside with them 🙂 And need a boring color for my husband who suddenly wants slippers. He’s really hard on footwear, thought; so I’m thinking he should have felted ones. My son would also appreciate some, and he’s off to college this fall where it’s always cool/cold! Thanks for all of the references to make this project. 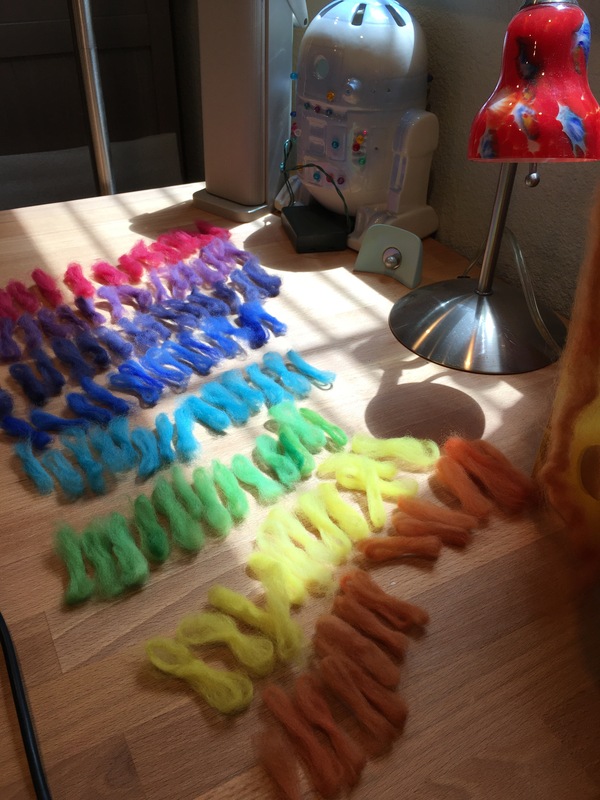 You can also find hand dyed multicolored roving to make rainbow thrums, but that’s even MORE putzy to separate the thrum colors. I’m through one and a half winters with mine and they have held up well. I highly recommend them for “going away to college” slippers. My daughter says they are like secret hugs for your feet. Can’t wait to see yours! So cool! not just the thrums (They’re as spectacular as the name itself!) but all the great words in this post: Recycled Lamb! Frabjous Fibers! Three Feet of Sheep! Sweaty Summer Rainbow Feet! My mind is reeling with delightful pictures.If I was even one bit crafty, I’d make thrums just for my two kitties to play with, since kitties love thrums.Roxie will be so jealous.